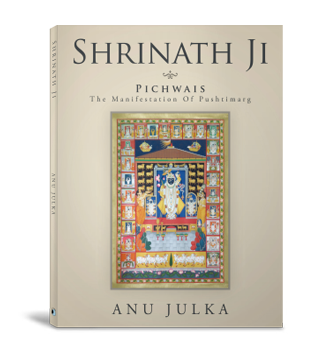 SHRINATH JI is about the Pichwai paintings, which have been in practice for the last three hundred years in Vallabhacharya Sect temples of Lord Krishna. These paintings portray Lord Krishna. Lord Krishna as a child is shown in different moods, attires, and postures. Painting Pichwai is an ancient form of art passed on from generation to generation, and it has a devotional theme toward Lord Krishna. Copyright © 2014. Anu Julka. All rights reserved.